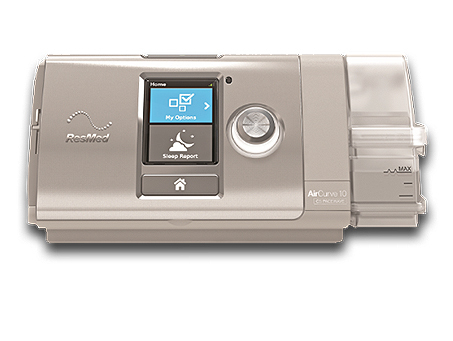 The AirCurve™ 10 CS PaceWave™ is indicated to stabilise the ventilation of patients exhibiting central sleep apnoea (CSA), mixed sleep apnoea and periodic breathing, with or without obstructive sleep apnoea. In CSA, normal breathing can be affected by reduced sensitivity to abnormal oxygen levels in the blood, leading to over-compensation in signals sent from the brain to the lungs to slow down (reduce tidal volumes) or speed up (increase tidal volumes) and breath rates and sizes. CSA is different to obstructive sleep apnoea, which is caused by a blockage in the upper airway. Your clinician will advise you if you have CSA. Some people have both types of sleep apnoea and this device will treat both. AirCurve 10 CS PaceWave is an adaptive servo-ventilator (ASV) with two modes: ASVAuto and ASV.